TOEFL Essay #9 – Should students evaluate their teachers? 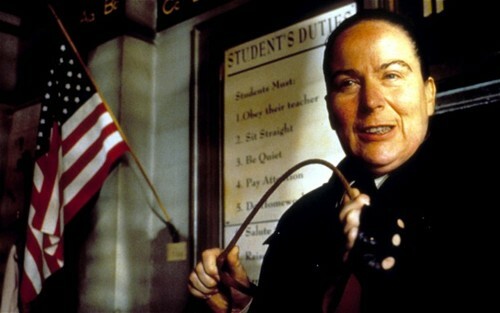 Agatha Trunchbull (Pam Ferris), headmistress of Crunchem Hall, where Matilda goes to school for the first time. A case supporting the idea that students should evaluate their teachers (and sometimes fire them directly). Form the book “Matilda”, by Roald Dahl. During my last high school year, it happened that one of my classmates sued the Math teacher. He claimed he had been discriminated against by the rest of the class. His marks, he added, were significantly lower than the score he deserved. After having heard five witnesses among the school staff, judge declared the teacher was not guilty. This experience revealed me that students cannot be objective judges of their own teachers, because of two reasons. Firstly, they are too personally involved in the teacher’s work. Even a simple bad mark could be interpreted by the student as “The teacher hates me”, which is – in my opinion – a totally subjective conclusion. Secondly, teachers could easily assign no homework to students in order to obtain a positive evaluation. In other words, students – especially bad ones – are not reliable, because they could easily be manipulated. The case of my classmate Luca is a telling example of what I mean. Even if I write seven years after I got my high school diploma, I remember clearly that during that period he was not doing Math homework, used to be absent the days of the written texts and to interrupt teacher’s speeches with useless considerations. Therefore, what else could the teacher have done, instead of giving him bad marks? However, my classmate Luca conclusion was totally different. He used to think that the Math teacher was not able to do his job. On the other hand, he had a strong preference for the English teacher, who was never present in class. As a consequence, we had never to do English homework. Only for this reason Luca was convinced that the English teacher was exceptional. To summarize, schools cannot ask students to evaluate their teachers. Unless they want to obtain totally unreliable results, indicating the contrary of the truth: that bad teachers are the good ones, and that good teachers are the ones who do not feel like doing their job.